If you are having issues with the Outlook client on your computer, and you recently changed your password, then its probably not updating the password. 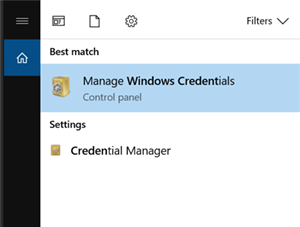 To fix the issue, you will need to clear your old credentials from the Windows Credential Manager. 1. Select the Windows key on your computer keyboard. 2. Type "Windows Credentials Manager" and once found, open it. 3. You should see your credentials for Outlook, MS Office, or Microsoft Office. 4. Expand each one and select Remove or Remove from vault. You do not have to clear the virtualapp/didlogical credentials, but all other office related items need to be cleared. 5. Once done, close the Windows credential manager and open Outlook. You should be presented with the Windows security box prompting you for your new credentials. 6. Enter your new password and check the box beside "Remember my credentials". 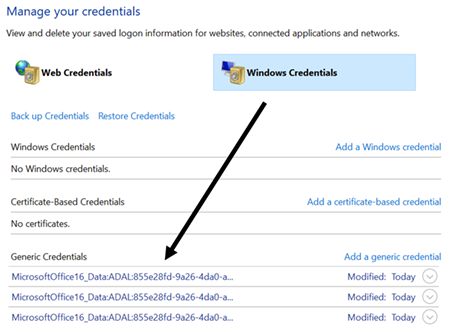 Selecting remember my credentials will add the credentials back to Credentials manager, and this will keep you from having to enter your password each time you open outlook.